Who says stockings are just for toothbrushes and knick-knacks? 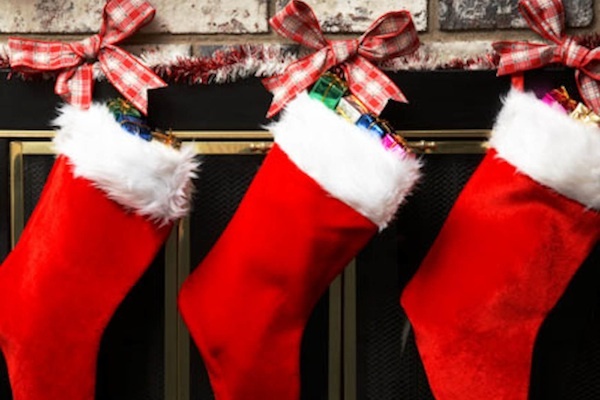 A smartly stuffed stocking can delight its opener as much as any of the bigger presents waiting under the tree. Liven up your mother, sister, wife, or girlfriend’s stocking with small and affordable natural items that they’ll actually use. All-natural lip balm and luxurious body butter top the list of our eco-beauty stocking suggestions—both are likely to please just about any woman. The Badger Lip Balm in Vanilla Madagascar is a dreamy and nourishing pick and, on the body butter front, Pacifica Body Butter in Indian Coconut Nectar is a rich, fragrant and moisturizing option, made from natural ingredients like shea butter, almond oil and safflower oil. Pacifica also makes great roll-on fragrances—another nifty natural stocking idea. Perhaps not the most exciting, but always useful, is a pair of cute organic socks, like the colorful Skippin’ in Stripes Socks from PACT. If you’re inclined to sneak a bigger (or at least more expensive) gift in with the smaller items in a stocking, go for the Revolution Organics Freedom Glow Beauty Balm, a foolproof and multi-use color stick that should be in every eco-conscious makeup bag. With endless eco-friendly possibilities, your loved one’s stocking may even become the main attraction on Christmas morning. For more suggestions check out the scrolling slideshow below.